Ahoy! Here We Go Around the World with 10 Little Rubber Ducks "Ducks overboard!" shouts the captain, as a giant wave washes a box of 10 little rubber ducks off his cargo ship and into the sea. The 10 little rubber ducks are swept away in various directions. One drifts west, where a friendly dolphin jumps over it. A whale sings to another. But, as the sun sets, the 10th little rubber duck is left all alone, bobbing helplessly on the big wide sea. Small readers and listeners will empathize with the little duck's plight -- and will rejoice at the heartwarming surprise ending.In this poignant and funny story, illustrated with strikingly designed collages, Eric Carle also takes readers on an exciting voyage of discovery. Following the little ducks as they float to all parts of the globe, young explorers can see for themselves the meanings of directional words, and learn simple math concepts such as counting and the use of cardinal and ordinal numbers. Each creature the ducks meet is seen in its own habitat and behaves in a true-to-life manner, offering a very simple first view of biology and geography.All aboard for a world of learning and fun! 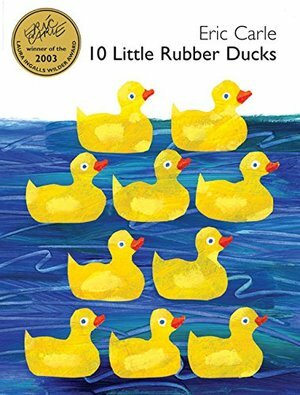 The 10 little rubber ducks is a very interesting book. It lets you go on the adventure of each rubber duck after the fell into the sea from a boat. You can visit all the exciting places they go and what they do.